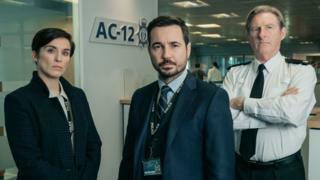 After two years, Line of Duty is back and it's "definitely the scariest" season yet, says Martin Compston, who plays DI Steve Arnott. The season four finale was watched by 7.4 million viewers in 2017, with the Telegraph saying the show "blindsides viewers with its canny genius." The Guardian said it was "more like being abducted by TV than watching it". Line of Duty's plots are unpredictable to say the least, and there were gasps from the audience during a recent screening of season five's opening episode. Compston and co-stars Vicky McClure and Adrian Dunbar are careful not to drop any plot spoilers, so we will follow suit. However, if you do not want to find out what happened in previous series of Line of Duty, look away now. The trailer for the first episode reveals that three police officers have been murdered in a hijack by armed men wearing balaclavas. McClure's character, DI Kate Fleming, says the hijack "required a police insider". The final episode of series four cast suspicion over Dunbar's Superintendent Ted Hastings for the first time. Is he as clean-cut as he appears? Duplicitous WPC Maneet Bindra is also back. Much has been made of the identity of "Balaclava Man", the ringleader of the criminal gang suspected of working with a corrupt, high-level police officer known as H.
Balaclava Man, aka gang leader John Corbett, is played by guest star Stephen Graham, whose previous work includes This Is England and Pirates of the Caribbean. "He's the most dangerous guy we've come up against by far," says Compston. "Stephen's a force of nature as an actor, and it was great having him on set, because it lifts our game when he's on. "He's genuinely scary," he adds. "Bullets will fly." The new series sees a change of direction for AC-12. "Usually the AC-12 remit is going after bent cops, but we've been chasing this mythical character H and we're not getting any luck, so we're changing tack," says Compston. "We're actually going after the criminal gang who the cops have been in league with, so we're going to see behind the balaclava. The levels of danger are ramped right up." Off-set, Graham is great friends with both Compston and McClure. "He's a powerhouse," says McClure of Graham, who calls the actor "one of my best mates". When Graham is on set, McClure continues, "we all have to pull our socks up." But she's sad she didn't get to work with him more. "There's not a lot with me and him in this," she says. The camaraderie between McClure, Compston and Dunbar is palpable, and McClure misses them when they're not filming. "I get really emotional," she says. "I love these two guys." The actors live in adjoining flats in Belfast when they are filming the show, with Dunbar revealing they have "designated rooms". Lines are learnt in McClure's flat, meals are eaten in his, while Compston's is the "party flat with all the booze". McClure says Jed Mercurio's scripts are terrifying to open. "We all panic we're getting killed off," she confesses. Mercurio - who also wrote Bodyguard, the most watched BBC drama since 2008 - is known for bumping off characters when you least expect it. Security surrounding the scripts is incredibly high. ("Rightly so," says Compston.) No one wants to spoil the suspense for viewers. Yet Dunbar is prepared to give away a tiny nugget of information about Hastings, saying "there's something going on with him" that "will be explored". "His personal life is in focus again," the actor continues. "He'll find himself under scrutiny." Dunbar didn't know until the last day of filming on series four that his character was going to be seen looking oddly shifty. "Those shots at the end of series four weren't in the script," he says. "Jed came on to direct that last bit and suddenly he put in those few shots. "I thought, 'what's this he's doing, why are we doing this?' And then I thought 'Oh. My. God'. "I just thought, 'you git - how dare you!'" Dunbar laughs. "'We've just gone through six episodes and you do this when we're at the end.'" Despite the show's enormous popularity, it seems fans are happy to be kept in the dark. "People like to watch it in real time and then talk about it the next day. Of course there are people catching up on it, but fans like the page-turny twists and they don't like to know in advance. "That's what gives the show such credibility I think." Rochenda Sandall is another guest star on the show. The actress, previously seen as policewomen in Coronation Street and Girlfriends, plays Lisa McQueen, Corbett's second in command. Being on Line of Duty is "a total dream come true as an actor", she says. "It's like a massive family, we had such a laugh." Sandall reveals there is a "power struggle" between her character and Graham's - and that she too wears a balaclava. Because of her hair, though, she had a "special lady one to fit my barnet". Sandall says it's "quite unusual for a woman to be in that line of work", explaining that her character "rose up through the ranks" of the gang. The show is so huge there's been talk of it going to the US. Were that to happen, who would the stars like to be played by? "I think Richard Gere would be a good fit for me," says Dunbar without missing a beat. Compston chooses Tom Cruise, "because of the height". McClure says she'd like to be played by "Jennifer, um I can't remember her name…"
"Lopez," suggests Dunbar. "You could call it Line of Booty." "To be fair, I have got a big arse," laughs McClure. (She hasn't.) "But Jennifer Lawrence is who I was thinking of." Despite the jokes, the show is a very serious business. But while another series has been commissioned, Mercurio says he doesn't know how long the drama will run. "A lot depends on how people respond to it," he says. "It's got a life-span, so I'll calibrate that against the audience response." His final words? "We like to surprise." Line of Duty is on BBC One on 31 March at 21:00 BST. The first episode of the Obsessed With… Line of Duty podcast will be available soon on BBC Sounds, with further episodes available the day after each episode broadcasts.